Unless you're attending Medieval Times, you'll most likely need a fork to eat your dinner. Especially if you're a germaphobe who doesn't like to get his or her hands dirty. Forks have been a necessity ever since they were invented and having all of your party guests without them would just be blasphemy. 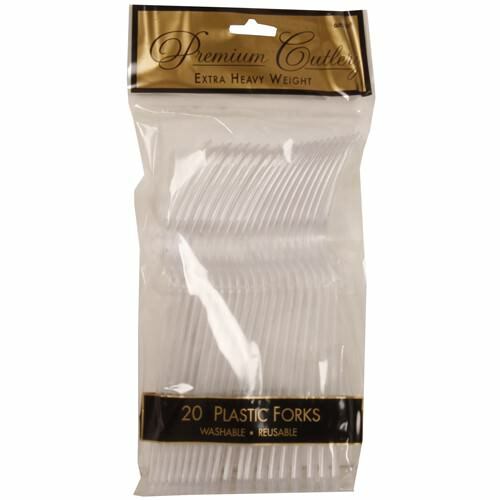 Clear Plastic Forks are simple, standard and a necessity for any party or gathering you may be throwing. From barbecues to birthdays and pasta to ice cream cakes, don’t let your guests be caught without a fork. Even those little kids who think making messes are fun. Just tell them to put a fork in it (it being their dinner of course). The clear plastic is great for clean up. No need to wash a ton of silverware after that big Thanksgiving, Christmas or July 4th party you're throwing. Clear Plastic Forks are strong and durable so you won't have to worry about them breaking mid bite. They ship in packs of 20.